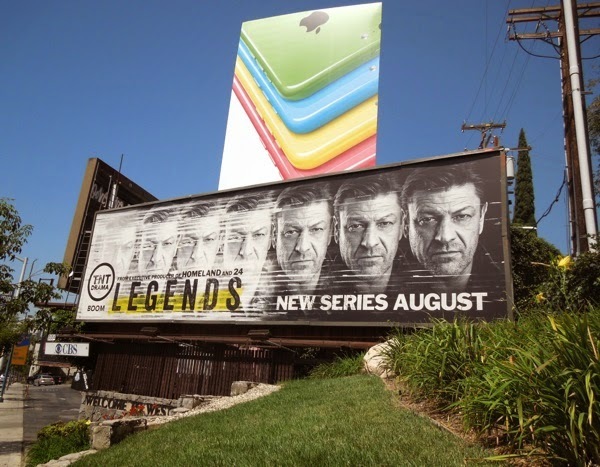 After his shocking death in Game of Thrones, Sean Bean is back on television this August in his new TNT espionage series, Legends. 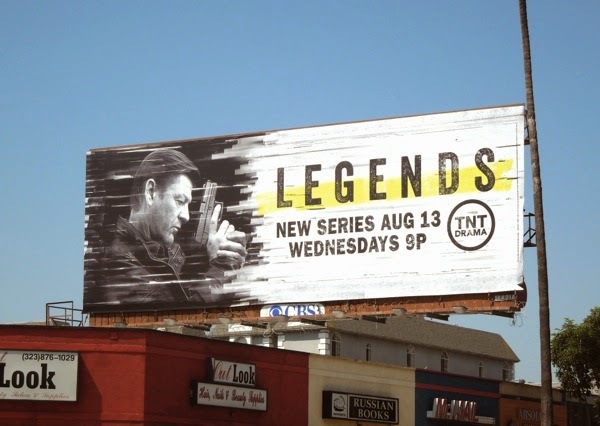 Based of the 2005 novel of the same name by the renowned grand master of spy fiction, Robert Littell, the British actor plays 'Martin Odum', an FBI agent with a talent for transforming himself into a different person for each undercover mission. However what happens when this secret agent with a labyrinth of memories and past identities suddenly starts to questions who he is and what his real motivations are. 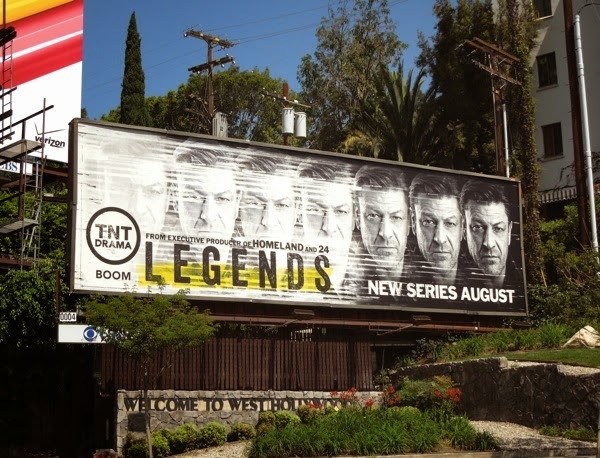 This black and white series premiere billboard for Legends, hinting at the many faces of Sean Bean, was spied along Sunset Boulevard in West Hollywood on July 3, 2014. 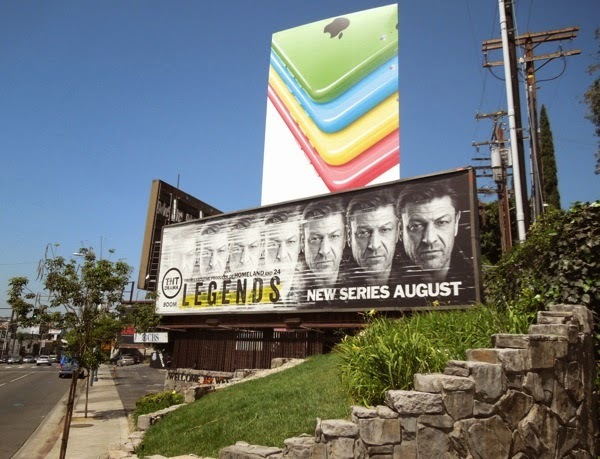 If you're a fan of the actor, be sure to also check him out in these Games of Thrones season one billboards from 2011. 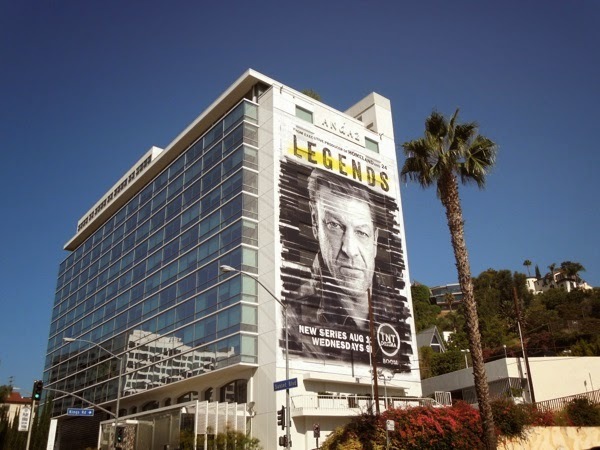 UPDATED: TNT are certainly making the most of Sean Bean's famous face as his rugged mug is currently gracing two giant-sized billboards on the sides of West Hollywood's Andaz Hotel along L.A.'s busy Sunset Strip. 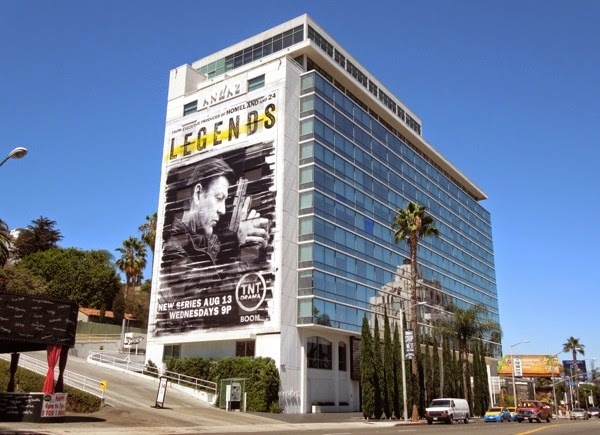 In the world of spy craft, a legend is an undercover agent's fabricated background story or biography, which is usually supported by revenant documents and memorised details. 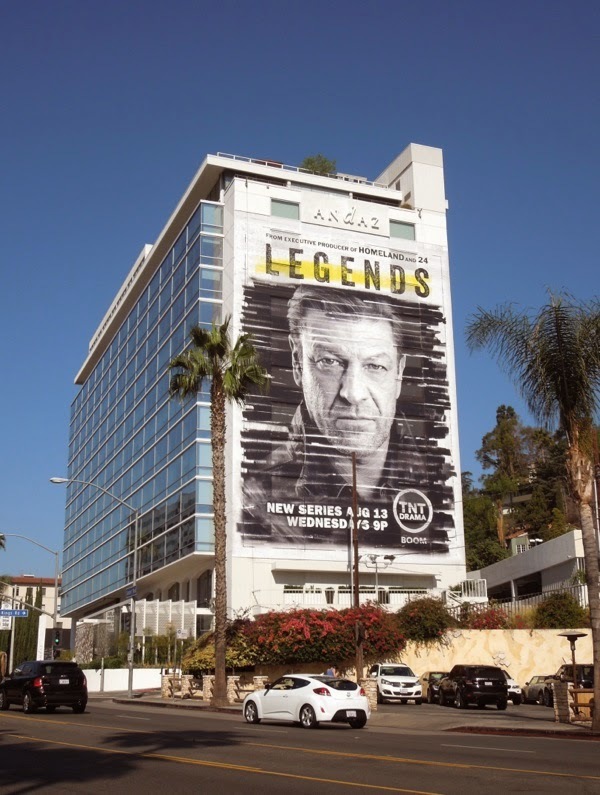 Sean Bean certainly looks like he could exist in a world of espionage, and you can see the 24 producer credentials shining though in these ad creatives. 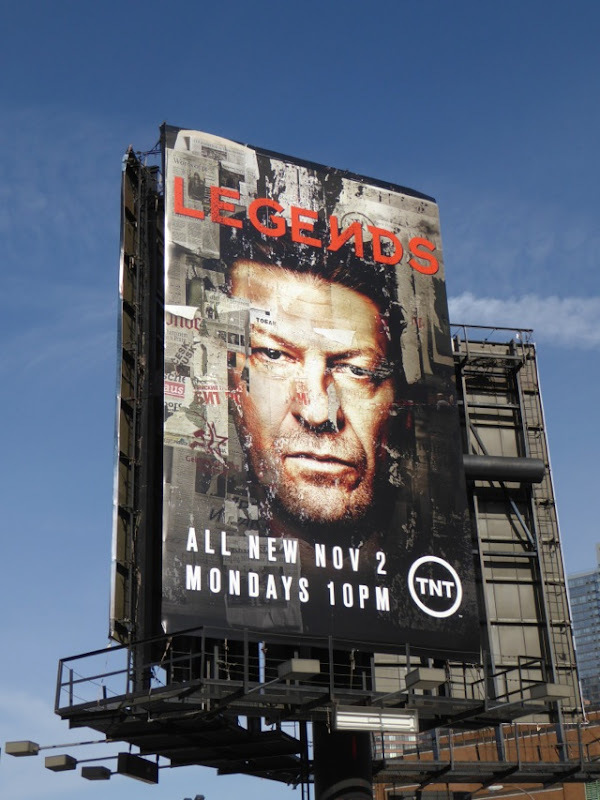 After all with as a varied career as this actor has had, he should be perfectly suited for this new series, as he's had many faces and been everything from Lady Chatterley's lover to 'Richard Sharpe' serving in the British Army during the Napoleonic Wars. He's shown the failings of man as 'Boromir' in The Lord of the Rings trilogy and been 'Zeus', father of the Olympian gods, in the Percy Jackson movies, plus he's even played a MI6 double agent in the James Bond movie Goldeneye. 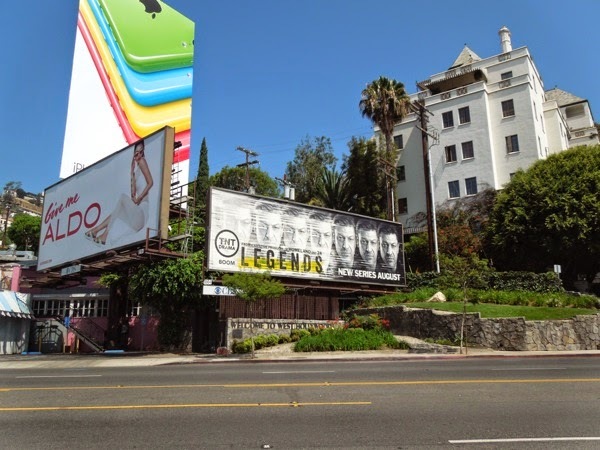 These striking super-sized Legends wallscapes were spied eastbound on July 24 and westbound on July 30, 2014. 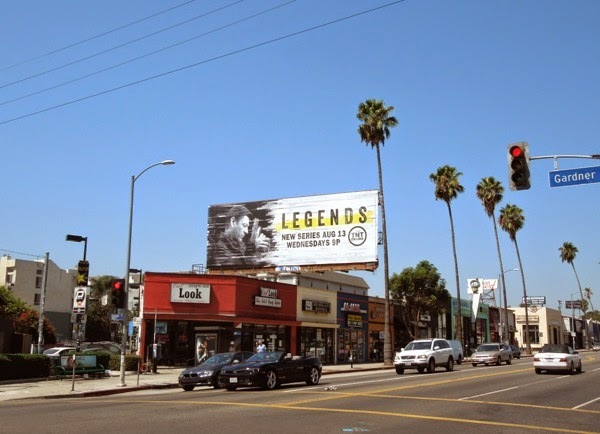 Plus here's an additional landscape billboard creative spied further east along Sunset Boulevard on July 31, 2014. 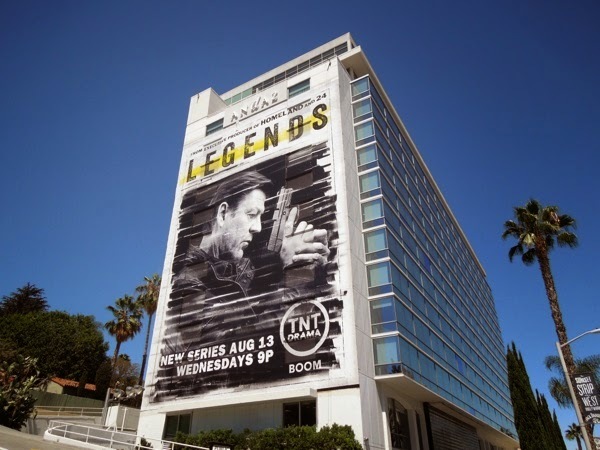 Let's hope that Legends can offer something new to the espionage genre, as the recent 24: Live Another Day seemed to be a rehash of old storylines and scenarios, proving that time had run out on that counter intelligence series. 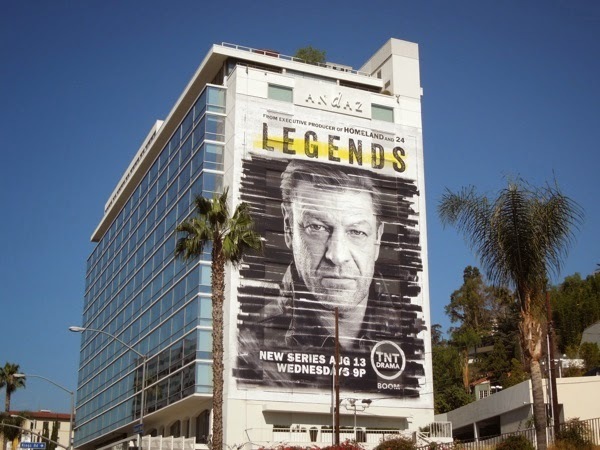 UPDATED: Sean Bean is back for a second season of Legends and the series has undergone a bit of a makeover, now with two storylines, one set in modern day London and the other set fifteen years earlier. 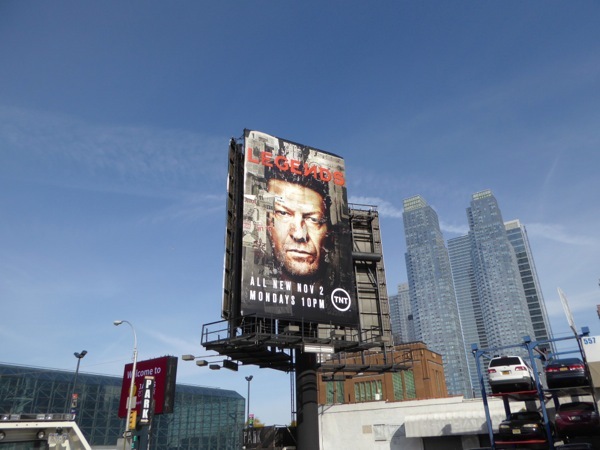 This sophomore season billboard was spied opposite the Javits Convention Center in New York City on October 31, 2015.